ISO 14001 The Tadaoka Plant: ISO14001: 2004 Environmental Management System certified in 2003. 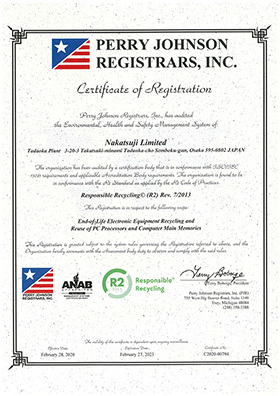 Nakatsuji Limited at the Tadaoka Plant aims to establish a new recycling system to meet the needs of the times, which would contribute to global environmental maintenance and the realization of a recycling society. Our efforts are to be focused on improving the recycling processes of scrap metal and recycling discarded office automation equipment. We are to implement and improve the environmental management system in conformance with ISO14001, aiming to reduce the environmental impact of our products and services. The Tadaoka Plant is to reduce its environmental impact, adhering to all laws and regulations. The organization shall consider how it could cause pollution, and make a plan to prevent hazardous substances from entering the environment, and also consider the results of government environmental impact evaluations. The Tadaoka Plant shall establish a department for implementing environmental protection activities to monitor that policy is being followed. The environmental policy shall be documented, and made known to regular and contract employees. The organization shall deliver training and awareness programs to its personnel. The environmental policy shall be posted on our website, and produced to the public if requested.